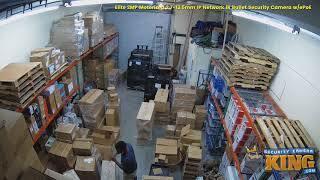 This is the latest in a long line of quality Security Surveillance Cameras from our Elite series of products. The IPOB-ELS2IRZA-EP is a 2MP/1080P bullet security camera that can be used to create a new IP Security System or replace an existing system. With a long list of features, this camera adds to standard capabilities with capabilities that are essential to you being able do a better job of keeping what’s yours safe. There’s no problem using this camera indoors or out since it’s protected against the elements and has even been rated IP67 with a certification against dust and water penetration. One of the features we’re sure you’ll appreciate is the audio in and out that will allow two-way communication with optional microphones and speakers. While fixed lens cameras can work in a multitude of different applications, sometimes you need the ability to zoom in and this camera gives you that flexibility. With a 3.7-13.5mm motorized zoom lens, you can strategically place this in a location where there might be a need to see close up and details and now you can do that from your computer or mobile device. Thanks to the latest technology, you can transmit data and power your cameras further using ePoE (extended PoE) as long as you use an ePoE compatible switch. With ePoE, you can reach transmission distances of approximately 2,624 feet @10Mbps or 984 feet @100Mbps. If you prefer, you can still use this with standard PoE (Power over Ethernet) as well as a traditional 12V DC power supply. These cameras have been built with convenience and the ability to improve your experience in mind. Continued software updates even mean you can save hard drive storage space thanks to the new H.265+ compression codec that reduces your bit rate and storage requirements by up to 70% over the previous H.265 standard. 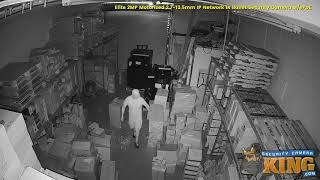 IVS (Intelligent Video System) are a set of controls that allow you create “Tripwires” or areas within a scene that will trigger email notifications or alarms if those tripwires are crossed, objects are removed or objects are abandoned. It’s almost as if you have a security guard right there watching over your home or business. You can even set the camera to notify you if it is moved and the scene changes. The patented Starlight™ technology allows the camera to produce vivid color images with very little light helping the camera to keep from switching over to black and white with the IR lighting until absolutely necessary. Additionally, the camera uses other features to continually improve your video quality, thereby improving your experience. Wide Dynamic Range or WDR is a feature that works by taking high contrast video and combining over and underexposed portions to reduce the effects of glare, etc. The built-in LEDs give the user the ability to see up to 164 feet in low-light and total darkness thanks to the efficient IR (infrared) lighting. This camera comes backed by a 2 year warranty and as always, FREE US based tech support and FREE remote monitoring apps.